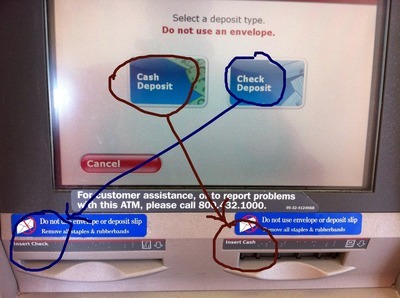 Do all BofA ATMs have the slots in this order, or only specific models? In which case, since users will probably encounter multiple models but the same UI, it's important for the UI to be consistent between machines, since after a few uses, customers will stop reading the screen and start blind-pushing. All the BoA ATMs in my area are the exact same hardware model. Are you suggesting that people on the east coast should have to reverse their logic just so that Californians traveling to visit us can withdraw money without any confusion? Pheeh on that. By the way... the other annoying thing about their ATMs is that you have to re-dip your card and re-enter your PIN after making the littlest mistake. Even when it says "Exit or try again?" the "try again" function asks for your card and PIN again... which is EXACTLY what "exit" would require you to do. It is a distinction without a difference. Really, I applaud their efforts to have a consistent UI on different hardware.